Baseball is arguably the ultimate existential sport – and I have been a Mets fan from birth. I would like to say that for me, being a Mets fan has been genetically encoded—an existential given—even though I know it is impossible having been born to a Yankees fan and a Minnesota Twins fan just a few years after the Mets came into existence. That’s not even enough time to make being a Mets fan even a recessive trait. Yet, in the tradition of most ancient cultures, I do have a bit of my own creation myth. And I believe that being Mets fan MUST be an existential given because try as might sometimes, it as much a part of me as my green eyes and my 5’2” frame. At some point, perhaps in infancy, I might have made a choice, one might argue (I wouldn’t), but it is too late now. You can learn a lot about life from watching baseball. During baseball’s six-month-long regular season, teams play almost every day, creating a world of its own. To the baseball fan and indeed to the baseball player, the ups and downs of the each game are—like life—colored by the constant unspoken presence of existential anxiety. In “real life,” this is the recognition that we are born into a human body and that we will at some point die. In baseball, “death” manifests either on a team level as an extended losing streak—one that could cause a team to fall out of contention for the playoffs—but more importantly and more frequently on an individual level as injury to a player. Injuries are extremely common in baseball and can change the fortune of player’s and team’s fate in an instant. 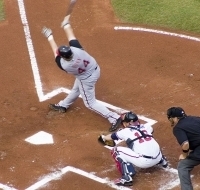 And often baseball injuries tend to have a “freakish” quality about them, where two players accidentally collide in an awkward fashion and one walks away and the other requires season-ending or career-ending surgery. The reason I mention all of this is because recently, on one terrible Sunday afternoon in New York when the Mets were playing against the Atlanta Braves, the Mets lost two of the best players—Jose Reyes, the leading hitter in the National League, and Daniel Murphy, the fifth leading hitter in the National League—to injury in the same game. Of the two injuries, Murphy’s was by far the more devastating—a torn ligament in his left knee—that knocked him out for the rest of the season. For Reyes, his strained hamstring put him on the disabled list for three weeks for the second time this season. Each injury also had an extra disheartening effect quality on the team. Statistics have shown that the Mets play significantly better with Reyes and his energy in lineup. Murphy’s injury came on a play at second base when one of the Braves slid poorly into the base, knocking Murphy’s knee out of joint—a painful thing to watch. Ironically, Murphy lost most of last season to similar injury to the other knee on a similar play. Reyes left the game in the second inning and Murphy in the seventh. When Murphy limped off the field, supported by the trainers, a pall came over Citi Field. The game continued but fans could neither cheer nor boo. The Braves won but no one seemed to care because the real loss had already happened. News reports from the clubhouse afterwards remarked upon the funereal quiet among players as they waited for medical reports. The Mets as a team lost 13 of 19 games following the injuries until Reyes’s return to action at the end of August. In his discussion of Kierkegaard’s thoughts about anxiety, Rollo May (1950/1977) says that Kierkegaard considers “normal anxiety,” as opposed to “neurotic anxiety,” to be a state characterized by “the possibility of freedom” (Kierkegaard in May, 1950/1977, p. 38). May talks about this “normal anxiety” state as a creative one, full of possibility. This echoes the feeling that every baseball fan feels on Opening Day. A team with the worst record the previous season starts with a clean slate and the season feels full of possibility for a World Series trophy. Even amidst teams going nowhere now in September, like the Mets, whose slim chances for a playoff spot were dashed by these injuries, the possibility of having their first homegrown batting champion in Jose Reyes should he stay healthy and should he continue to hit in the last month of the season. But these are a lot of “ifs.” Although even Yankee fans, who are used to winning and may experience less angst than fans of most other teams, have had some of their own this season, proving the Yankees are not immune to the same possibilities of injuries and slumps. However, they are still likely to make the postseason. Heidegger (1962) talks about “primordial anxiety,” (p. 356) an anxiety that brings us face-to-face with the possibility of our own mortality. At some level of awareness, that same feeling pervades every game for the diehard baseball fan and for the baseball player. Watching Reyes in his first games back from his injury, many people watched him particularly closely on plays to see if his leg would hold up. Even his manager, Terry Collins, admitted during a postgame television interview to watching for signs of trouble, although he did not admit to outright nerves seeing Reyes run hard around the bases or dive to catch batted balls. In order to watch baseball and in order to play baseball, the fan and the player must draw upon what May (1975) says is a key to dealing with the existential anxiety of the unknowns of life, injuries, failure, and death—courage, in all its forms. May (1975) said, “We are called upon to do something new, to confront a no man’s land, to push into a forest where there are no well-worn paths and from which no one has returned to guide us” (p. 12). This is the start of every game. The rules may be the same, the players may be the same, the field may be the same, but there is a sense of creative possibility as soon as the umpire yells, “Play ball” that has enraptured millions and millions of fans and players for more than one hundred years because each day’s game starts with the premise that yesterday’s game is forgotten. There may be, especially in this age of computerized matchups, all sorts of statistics detailing the history of the players’ previous interactions. But statistics cannot predict that a pitcher who never had a hit in his life won’t hit a grand slam home run or that someone might steal home. It takes a lot of courage for ballplayers to show up at the park every day, especially when they are losing (although they are getting paid a great deal of money to do so). And it takes a lot of courage for the fans to stay with the teams and continue to root for them when all good sense and evidence to the contrary—e.g., a losing record and nervous stomach—says not to. But every day is a new day, filled with creative possibility and every game is a new game. And while there might be a horrendous injury, there might also be that perfect game. That’s what makes staying with the Mets an existential decision: even if it feels like I don’t have a choice. I think Kierkegaard, Heidegger could have gotten a lot out of the World Series. Heidegger, M. (1962). Being and time. Oxford: Blackwell Publishers Ltd.
May, R. (1975). The courage to create. New York: W. W. Norton & Company. May, R. (1950/1977). The meaning of anxiety. New York: W. W. Norton & Company.